Everyone loves a heel, especially one to whom nothing was sacred and who charmed his or her way into the hearts, minds, and wallets of bumpkins and belles alike. Hornswogglers, Fourflushers, and Snake-Oil Salesmen offers dozens of tales of petty bandits, sleazy bunko artists, and conniving conmen (and conwomen!) who traveled West to seek their fortunes by preying on those who went before them to settle and explore. Hornswogglers, Fourflushers, and Snake-Oil Salesmen tells who these nefarious ne’er-do-wells were, what they did, and why they are remembered, and each chapter is illustrated with engaging historic photos and illustrations of the shady characters at work and play. Caution: Lock up your wallet before reading! 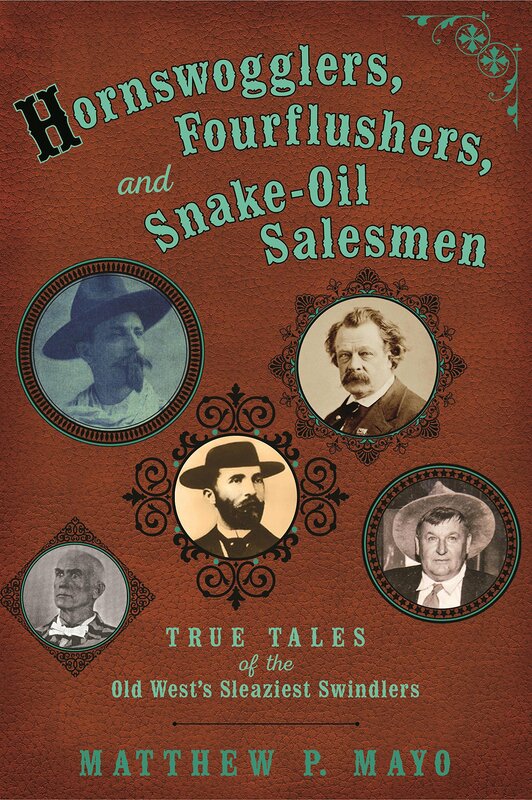 “HORNSWOGGLERS, FOURFLUSHERS & SNAKE-OIL SALESMEN: True Tales of the Old West’s Sleaziest Swindlers by Matthew P. Mayo (TwoDot, $18.95) spins 22 yarns about the bandits, conmen, conwomen and bunko artists who populated the West, drawn by the chance to make their fortunes by taking advantage of those who responded to the siren calls of gold and free land. Mayo proves the adage that everyone loves a heel, making sympathetic characters out of the most disreputable reprobates, putting them in a historical framework with an accessible, lively story-telling style. More than that, however, he puts them in context with each other and poses questions about what makes a villain a villain. How much does Ned Buntline’s sketchy personal history and questionable veracity affect the fact that his dime novels shaped much of the mythology of the West? Why do we feel twinges of sympathy for con artists like Doc Baggs, who preyed on the greed of his wealthy marks?